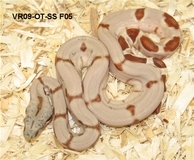 The Orangetail Hypo line was started back in the early nineties by Jeff Gee. He started with Hypo Boas that originated from Panama & bred them to each other for multiple generations to produce as clear & clean a boa as possible ( little to no black speckling ). I have continued that practice & I am currently up to 5 generations of selective breeding to produce the best & most beautifull examples of these wonderfull boas. I have bred my best pairs to each other to create F5 Offspring with some wonderfull results. 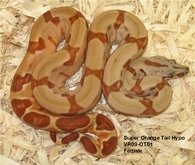 These Super Hypo Orangetails are a deep red / orange with little to no speckles. 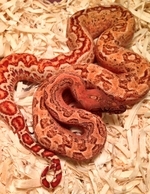 Since they are pure Central American Boas - they also stay quite small & breed at a small size too. Update 2018 - If all goes well I should have some very nice Super Hypos in July.